Over twenty years ago, Ene and I built our first and only boat together one winter on the porch when we lived in a one room cabin perched over the Hudson. The cabin was built atop a sea wall on a narrow spit of land to the west of the railroad tracks, and the open porch, which cantilevered over the river, largely determined the size and type of boat- a 16 foot, hard-chined sharpie for rowing and occasional sailing. When the ice flows melted that March, we lowered the finished skiff directly into the river from davits hung from the porch rafters and set off to explore the contours and tides of the Hudson and inland sloughs of coastal New England aboard our newly christened ‘Calabash’. This marked the beginning of my adage all vessels originate with an imagined voyage, and initiated my annual, autumnal obsession with boatbuilding that persists to this day. This year I’ve postponed planning the perfect cruising boat in favor of the simplest boat for optimal adventure with minimal effort. The dilemma to date has been how to build a vessel that is seaworthy enough for local conditions but adequately small for car-topping or trailering, without taking up too much space or time in my busy woodshop. 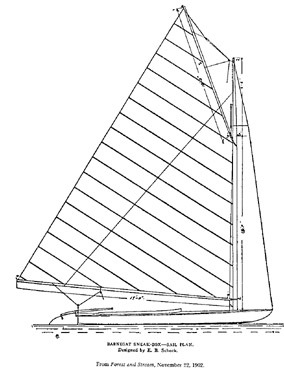 An open boat would require double ends and high freeboard to prevent shipping seawater, and a decked boat would require a self-baling cockpit and perhaps a small cabin for stowing gear and for sheltered, coastal camping. I currently lack the time or resources for either scenario, so I’ve decided to radically shift the program and design my own board boat, essentially an elaboration upon the time-tested, sailing surfboard. 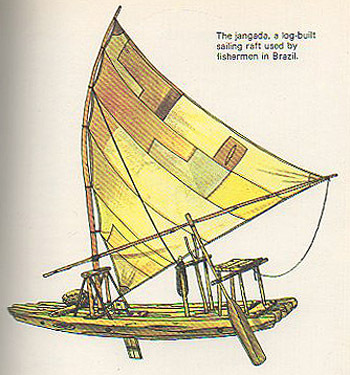 The board boat I have in mind will combine elements from the traditional Brazilian jangada (at top), the Barnegate Bay sneakbox, the early DIY sailfish from the 1940’s, and the Wyliecat 17, which appropriated the wishbone boom and the flexible, unstayed mast from sailboarding. I reason that if the problem is to avoid getting wet and potentially capsizing or swamping the boat, best to use these as the starting point for braving the rough conditions on local bays such as Tomales and Bodega. Crew will wear wetsuits and life vests and any gear will be lashed to the deck in waterproof bags. The goal will be to efficiently get out on the water whenever the conditions are just right and pack minimal provisions to ensure either a furious and fun day-sail or a night of camping on the remote beaches of Tomales Bay, where we have the seasonal option of digging clams or jigging halibut for our supper. The board boat project will also provide me with a visceral sense of local conditions which will ultimately inform my annual obsession with finding the perfect boat for extended cruising. Posted by Scott on October 5th, 2009, at 6:44 pm, and filed under all, Best Posts, expedition, project dispatches, visceral inquiry.